Block displays posts in a responsive block-based grid, and is designed to work seamlessly with Gutenberg blocks. The beauty of the Block Theme is its simplicity. Blog posts display symmetrically in a fully responsive block-based grid. Additionally, the theme demo was created using Gutenberg blocks. Gutenberg is the name given to the upgraded WordPress content editor. It’s currently available as a plugin, and still under development. However, it will soon be integrated into WordPress core. The Block Theme has been designed and tested alongside the development of Gutenberg. As a result, the theme works seamlessly with content blocks from Gutenberg. Don’t worry though, it works just as well with the classic content editor. The advantage of using Gutenberg blocks becomes clear when using the Block Theme. Content types such as images, videos, galleries, audio players and more are added as “blocks” of content. They can be arranged and placed into columns. Each block has its own set of options for changing the alignment, colors, font sizes, and more. As the editor evolves, blocks will become a drag-and-drop page building solution for the WordPress content editor. 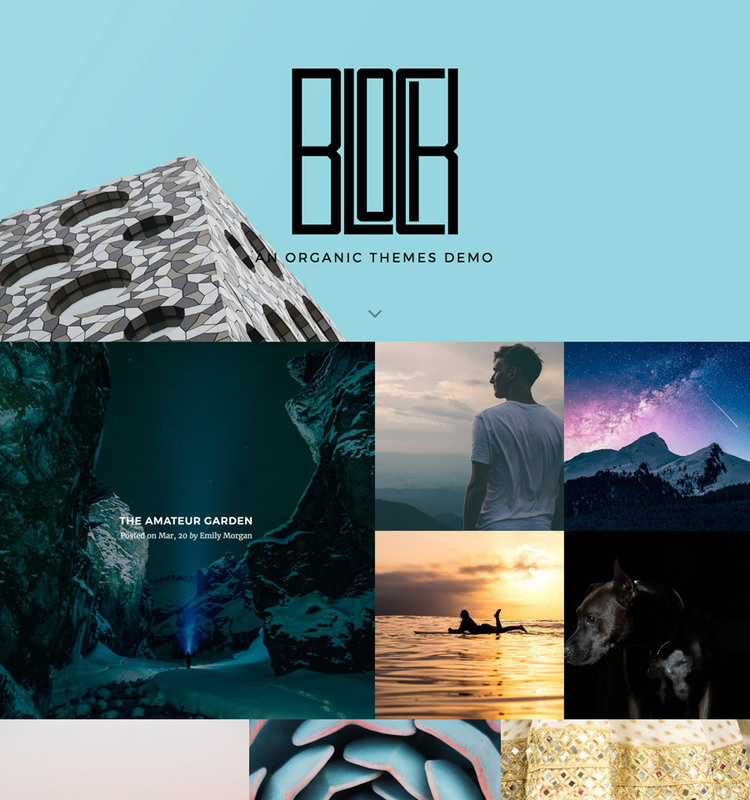 The Block Theme is fully compatible with our popular Organic Builder Widgets plugin. The plugin transforms the core WordPress customizer into a page builder using the power of custom widgets. So, you can create dynamic pages with featured content slideshows, background videos, testimonial sliders, team members, and more! Additionally, the theme is fully compatible with the WooCommerce plugin for creating eCommerce websites. Block also utilizes the One Click Demo Import plugin, so you can setup your site to look exactly like the theme demo with the click of a button. Like all Organic Themes, theme options are located within the WordPress customizer. As a result, changes to the options can be viewed in real-time as you setup the theme. There are no confusing custom options panels or an overwhelming amount of options. So, you can spend less time configuring your website, and more time adding content. The Block Theme is a solid foundation for building your WordPress website. It’s an excellent solution for artists, designers, photo bloggers and small businesses. Start building your website with the Block Theme!